As the hot stove is as cold as ever, I started putting a lot of thought into the hall of fame debate and who I think deserves to be in the hall come July 21st, 2019. If you're a baseball fan who has never been to the Cooperstown, then do yourself a favor a book a trip this summer. It's been about a decade since I was there so I'm sure things have a changed a little, but Cooperstown is a little quaint town on Otsego Lake in upstate New York. The Hall of Fame itself is right on Main Street - which cuts through downtown Cooperstown - and is full of ma and pop shops where you can buy almost anything you'd want with the Hall's emblem on it. Of course, don't forget to also check out Doubleday Field while you're there. My theory on the Hall of Fame - for any sport - is that it should honor the best players of the sport while also telling the biggest stories of the sport. You'll see this reflected in my ballot, but I believe that the best players from the steroid era should be enshrined in Cooperstown as they had a massive impact - for better or for worse - on the game and what it has developed into today. I believe that how they impacted the game should be stated on their plaque, but leaving them out is leaving out part of baseball's history. Another belief that I hold is that the designation of being a "first-ballot Hall of Famer" has much more meaning behind it than being elected in year two, three, etc. This will be reflected in the players who I would vote for. With that said and without further ado, here is my 2019 ballot. Arguably, Bonds is the greatest hitter of all time. Him not being part of the Hall of Fame is a complete oversight by the voters. Edgar Martinez earned 70.4 percent of the vote last year and very well could hit the 75 percent mark this year. If that happens, then that could open the floodgate for other steroid era hitters with Bonds being the headliner. The most recent pitcher to enter the 300 win club needs to be in the Hall. Keeping him out is almost as bad as keeping Bonds out, although Clemens isn't the greatest pitcher of all time he is one of the greatest pitchers of all time. Say what you want about the DH position, but when you are the greatest player at your position all time you deserve to be in the Hall. As I stated before, he was only a few percentage points away from getting the call in 2018 so maybe 2019 will be his year. In lieu of sounding like a broken record, just reread what I said about Edgar Martinez except put it in the context of the closer and saves. In my opinion, he's the first ballot hall of famer in the 2019 class. He's one of 27 who is part of the 500 home run club. His career OPS is four points shy of 1.0000. He was the World Series MVP in 2004 which snapped the Curse of the Bambino, and for 10 years he was one of the most feared hitters in baseball. Forget about your last memory of Manny (remember, he was with the Rays??) and remember him for what he was with the Red Sox from 1998 - 2008. Another member of the 500 home run club who could do more than just swing for the fences. 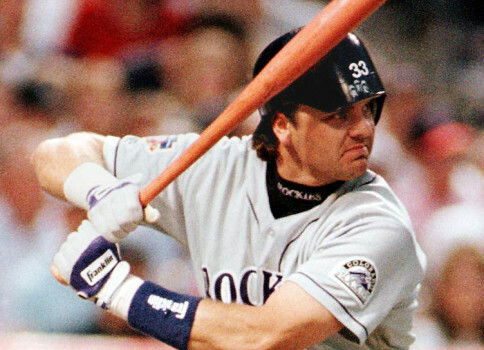 He won the NL batting title in 1992 and won five silver sluggers throughout his career. He also helped the then Florida Marlins win their first world series in 1997. If Manny and Sheffield get in, then Sammy Sosa assuredly deserves a plaque of his own. One of nine players in the 600 home run club. On top of his offensive game, he was actually a decent defender before he bulked up in the late 90's. I'm not of the mindset that we should discredit anyone because of where they played. If we are really worried about Walker benefitting from the thin Colorado air, then are we going to start discrediting players who will play most of their career at the little league field known as New Yankee Stadium? No, we're not although I would kind of enjoy that. Due to injuries, Walkers career numbers don't look great as a whole but when he was healthy he was lethal with the bat and was actually a good outfielder and baserunner. According to Baseball Reference, his WAR7 - that is the sum of the seven best WAR seasons - is higher than Sosa, Sheffield, Rivera, and Ramirez who all made my ballot. I went back and forth on this one, but ultimately believe he deserves a spot in Cooperstown. Plus it would be cool if we could get his plaque to have a picture of him with a backward batting helmet. Other players who I would vote for if it were not their first ballot are Todd Helton and Roy Halladay. I wouldn't be surprised to see Halladay get in the Hall on his first ballot as an empathetic vote. Don't get me wrong, I think he deserves to be there but I can't do it on his first ballot. What do you think about my ballot? Would you vote differently if it was the players first ballot compared to the second or third ballot? What does your ballot look like? IMO Halladay, simply put...doesn't have the career stats (not even close) for the HOF and I hope MLB doesn't start going NFL-like and letting everybody who had good post-season or Super Bowl stats, get enshrined (see Joe Namath as one example. )IMO Bonds, Sosa, and Clemens, and other steroid-tied players do not belong in the HOF period. Good list.I would agree that everyone on it should be in the HOF.I don't buy into the first ballot thing.If they are in what I view as the top 10 players on the ballot I would vote for them.I wouldn't consider if I think they are 1st ballot worthy or not, just a simple who is my top 10. I do think Coors Field should factor into the decision but Helton and Walker are still probably good enough.Walker played 7.5 seasons on different teams too.They both have pretty crazy home/away splits though.I can buy a hitter playing better at home but .170-.180 points of OPS better seems like park factor. That ship has sailed. Baines is in and Oliva isn't? Might as well open the flood gates and let everyone in. Should Hrbek be in the Hall? Put in a little nook that says the best of the cheaters - Steroid ERA heroes.They destroyed the meaning of stats, they gave us the forever reference to records the best outside the steroid era.I wish they had all dropped in year one like Palmeiro who accumulated HOF stats and never felt like a HOF players during his career.We used to have magic numbers - 60 and 61 - 714 and 755, but now I really do not care where anyone is on the all time list.For this insult to fans and the game I would never vote them in.I know the best hitter and the best pitcher...We have survived without Shoeless Joe and Pete Rose.In fact they are also responsible for harming the great reputation and story that the Hall presents. Yes, I feel anger towards them and it does not matter to me if Piazza or any other player has suspicion but no prove and slipped in.Bonds and Clemens are the poster boys, the symbols of that bleak time. Rivera needs to go in and I really do not care if anyone else does.Halliday is a sympathy vote and that is okay, but if he had not died would we have so much energy expended on him? Walker and others from CO suffer from this home and away splits like it is only the Rockies that have them.The Twins in 2018 had a 261/239 team split for home/away.The Yankees were 260/238 and the Red Sox were 282/255 - should all these players be judged the way that Rockies players are?No Home and away is part of the game.Judge the total stats and the complete player and stop punishing Rockies.Put Walker in. My issue with PED users not being in the HOF is that we will never know the true scope of it. We know steroids were prevalent in baseball during the 70's, why do we treat Hank Aaron differently than Barry Bonds? Punishing 2-3 players under the assumption of using is not fair when there is so much certainty that 4 decades or more have been clouded with steroids. I would vote Bonds and Clemens if it were up to me. I don't think Baines is a hall of famer.I don't think Hrbek is a hall of famer.I like the idea of the "Today's Game Era" committee, but think they really missed the boat on Baines.That said, if Baines is in I don't think Hrbek automatically gets in mainly because of the tenure (only playing 14 years) hurts his counting stats compared to Baines.I do think Oliva should be in though. I don't care one way or the other about Bonds or Clemens any longer. Both were almost certainly HoF quality before they started cheating, so whatever. I don't know whether it's better to vote 'em in to get rid of their presence on the ballot or let 'em stew. I'd hate for their entrance to be a signal that "nah, who cares about cheating and using dangerous drugs if you throw that baseball hard or hit enough dingers! ", though. Agree on Edgar Martinez, Mariano Rivera, and Larry Walker. Easy choices to me: Edgar was an absolute machine as a hitter, wasn't as bad a 3B as his rep, and should definitely be in. Mariano might actually get 100% on his first ballot. Larry Walker wasn't just a great hitter, he was always a great fielder and baserunner. And he hit everywhere he played. Great hitter in Montreal, great hitter in Colorado, great hitter in St. Louis. I'm a no on Manny. Elite hitter, but awful defensive player and bad teammate. Admitted cheater, and kept cheating after an understanding had been reached on what was and wasn't ok. His PED use wasn't a mistake or part of the wild wild west, so why let him off the hook? Sheffield is a no as well, I think. Another disastrous defender, I think he's below the standard and he's another guy who racked up All-star appearances he probably didn't deserve. Terrific hitter when healthy, but didn't add much else and he needed to hang on for a few junky years to get over 500 HRs. Sosa is also a no, I think. Too much of his overall value and stat accumulation was in a pretty short period and that was also almost certainly chemically enhanced. That's a hard vote for a guy who fell apart so quickly, basically cooked at age 35. Scott Rolen is a guy I'd definitely vote for. Fantastic defensive player, excellent hitter, and one of the elite 3B of all time. Despite the injuries, he was still elite. Mike Mussina is a definite yes as well. Absolute workhorse, consistently great. During an offensive explosion he was one of the best at keeping runs off the board. He's a no doubter for me. Curt Schilling is one I'd consider voting for, despite the fact that he's become an increasingly reprehensible human being. Not as consistent as Mussina, but a higher peak in fact. Had some absolutely huge years and was one of the premiere strikeout artists of his time. A big game pitcher to be sure, but that's just icing on the cake. Hard to vote for him, because of all the other crap that's he's gotten into after retiring, though. Helton, Halladay, and Andruw Jones all deserve some consideration. I'm probably yes on Doc Halladay, need to think about Helton some more, and no on Jones. Halladay didn't have the longest career, and it took him a few years to become the monster he became but that 10 year run from 2002-2011...man, he was great.